This week Amy of Amy's Creative Side is hosting another One Thing, One Week challenge. This was a short week for me as I was visiting my parents and away from my sewing machine until Saturday, but I was able to use the challenge to motivate me to complete a small, but important WIP. 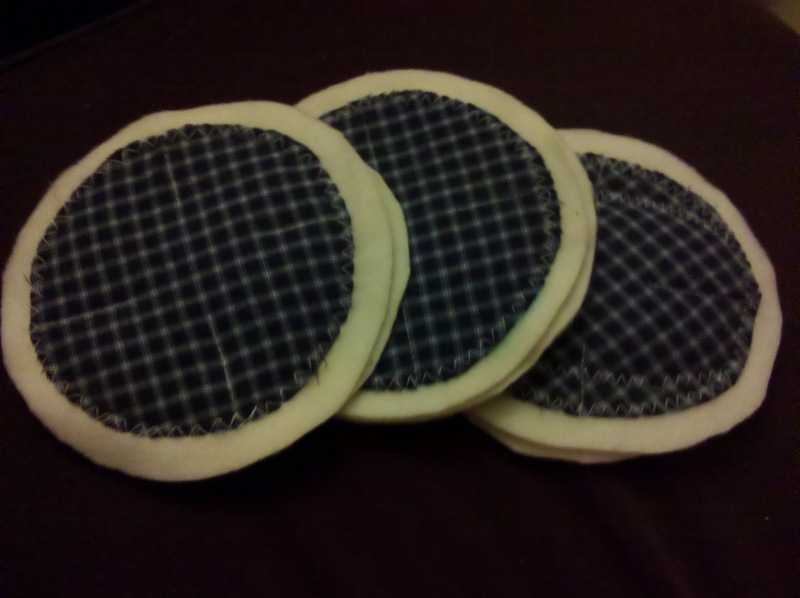 When my son was born I had made myself two pairs of pads for absorbing breast milk leakage using flannel on the inside, fleece on the backside, and a layer of Warm n Natural on the inside. I wanted to try them out before making more to make sure I liked them. Turns out I did like them, but it's two months later and I still hadn't gotten around to making more! I decided to play around with a couple more different materials. I decided to use the fabric form an old pair of 100% cotton pajama pants that had finally torn beyond use. The cotton is old and worn, and thus very soft, so I thought it'd feel nicer against the sensitive skin. I also wanted to play with the inner absorptive materials. I ended up making one pair with Warm n Natural again, one pair with a pair of disposable breast pads inside, and one pair with a couple of outgrown diapers cut down to size inside. Way to sew circuluar things! :) I'm afraid of those curves. Very useful and I'm sure much more comfortable than those throw-away store bought kind. :) Not to mention more earth friendly! i'm interested to learn how the one with the disposable inside holds up after washing. I just bought the washable kind when I needed them. But if I did it again, I'd rather be able to just make some, especially from recycled clothing like that.